Convex Mirrors Coming to America? Here’s an entry from the annals of “things I’ve always wondered about but never had the energy to bother checking on”: Why don’t cars in the United States have convex driver’s side mirrors? They sure seem to make sense to me, but who knows? Maybe there’s something unsafe about them that I haven’t thought of. As it turns out, I still don’t know. The proximate answer, of course, is that they’re illegal, but I don’t know why they’re illegal. The reason is probably buried in the mists of time. However, according to the New York Times, the Department of Transportation, after a grueling three-year process, is thinking about maybe, just possibly, allowing carmakers to use them. Thinking about bureaucrats in DOT taking three years to make a decision worth maybe half a day, having spent a couple of decades to even engage the question, through all of which millions of drivers outside the US have been running an enormous demonstration program showing the superiority of convex driver’s-side mirrors, can make a libertarian’s day. ….There’s more to the convex mirror than the Times story records. Not only is the field of view wide enough to cover the left-hand blind spot, but a convex mirror doesn’t have to be dimmed to prevent cars behind you from blinding you at night. Now, if we could get them in the right place, which is on the fender, visible through the dashboard so you don’t have to take your eyes off the road to be aware of what’s going on behind you, we’ll be making some real progress. For this location, they have to be convex, because at that distance, the field of view of a flat mirror is much too narrow. I’ve had convex fender mirrors (very hard to find, and it’s a nuisance to make a flat panel to replace the stock abortions on the doors) for twenty years and would never go back. I suppose I’m courting a ticket, but so far, no problems. 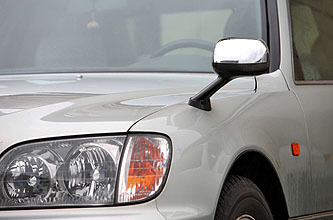 I still don’t know why flat driver’s side mirrors have been mandated in the U.S. for so long, so be sure and enlighten us in comments if you happen to know the answer. In any case, it looks like our long national nightmare may soon be over. Just please don’t tell any conservatives that DOT is considering this change so that U.S. rules will be “harmonized with European requirements.” You know how they feel about euro-weenies.